Around 10:30 pm last night, we went to go look for Riverstone. We were watching Netflix and noticed she hadn’t come to bed. It’s typical for Riverstone to bring us her gifts of toads, frogs, birds, mice, moles and bugs! She loves us! Daniel usually rescues the creature and has that role in this house. 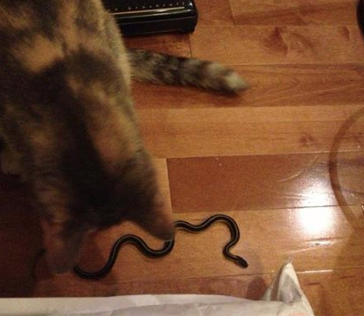 We started laughing at our over reactions but certainly not laughing we have a snake in the house. We were trying to think of ways to get the snake out and release it but not have to touch it. Snakes have their role in the environment and it’s a shame to kill it because it can reduce mice population and other creatures we have. We live in the country, so this is to be expected. So us pansies, we have to nut up and grew some balls of self confidence. By the way, wearing only oven mitts in our birthday suits is only hot when you are baking an “American Pie”, not catching a freaking snake! We scooped it up using a bowl and cardboard. We winced and squeeled as we walked it out the door. It was a full moon last night so there was 3 full moons and 1 snake! Two moons happen to be wearing flip flops! HAHA, another great title for this blog! We kept Riverstone inside and let the snake by on her merry way! We walked inside laughing at ourselves! Suddenly the world was right again! There seems to never be a dull moment around here! Glad for it too, without moments like this… life would be fairly boring! This entry was posted in General Life With Mikey & Diva Dan and tagged crochet crowd, Daniel, HAHA, Mikey, Netflix. Bookmark the permalink. hahaha! so funny! but you are braver then me! I cant even catch spiders and we don’t even have dangerous ones in this country!